Keto Chocolate Mousse Recipe - "Rich & Smooth" - Perfect Low Carb Dessert! Looking for a high fat dessert that is quick and easy to whip up, literally. 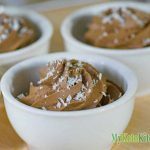 Look no further, this velvety smooth keto chocolate mousse will quickly become one of your "go to" ketogenic desserts. Scoop out the hardened coconut cream from the can, leaving the clear liquid behind, and place into a bowl. Add the heavy cream and combine with a hand mixer on low speed. Add the remaining ingredients and mix on low speed to avoid spraying cocoa powder everywhere, gradually build up to medium speed and mix for 2-3 minutes until the mix is thick. Serve in individual ramekins or glasses sprinkled with unsweetened shredded coconut.